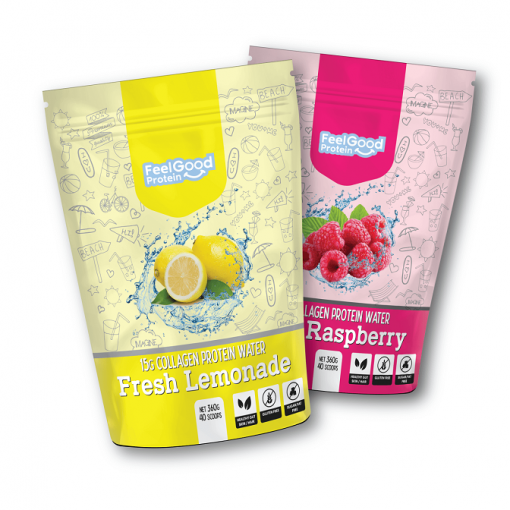 Feel Good Protein Water is an amazing new drink that’s full of protein and tastes sensational! The beautiful summer taste each flavour delivers simply refreshes all your senses! If you bloat from using dairy protein, then this is the drink for you! Made with the highest grade of collagen, sourced from Germany and manufactured in Australia. Using the best collagen available, we’ve been able to create a protein water that is easy to digest but also giving the best benefits of protein. Change the way you have been taking protein supplements with this convenient and tasty beverage. Take advantage of the power of collagen today and treat your body and taste buds to an amazing drink! Because we are the creators of the original protein water by Protein Perfection, we have been able to advance our existing technology to create what is now the best protein water in the market. Focusing on both nutrition as well as meeting the taste preferences of real gastric sleeve members, Feel Good Protein will have you feeling good. Feel Good Protein Water is perfect for everyday use, from everyday people to athletes to patients recovering from bariatric surgery. For each scoop (1) take between 300ml of water and shake well with a shaker cup. Water level may be adjusted to suit your taste preference. To achieve 15g of protein, a total of 2 scoops is needed. Store in a cool dark place away from direct sunlight. Bovine collagen sourced from Germany. Manufactured in an Australian facility that produces dairy, egg and soy. May contain traces. To learn more about collagen protein and visit frequently asked questions, visit our FAQs.